A destination wedding in Pune, considered as a cultural hub of India is a unique destination away from the bustling city of Mumbai. There are several 5 Star wedding venues in Pune, as well as banquet halls that add to the charm of a special event. Pune is a city of rich culture, heritage and modernization. Always high on energy, the city always has a lot to offer as the second largest city in the state of Maharashtra. As a leading IT hub besides being an engineering centre, there has been a phenomenal growth in the number of event venues in Pune. If you’re looking for some local sight visits then these are not to be missed – Aga Khan Palace, Shaniwar Wada, Sihagad Fort, Chaturshringi Temple, and Pateleshwar. You can use Indian Rupee as a mode of exchange in the city. People in Pune speak Marathi for communication. WOW Venue has compiled a list of venues below for your event in Pune. Undri hosts #WowVenue Verified Venues, ranging in capacity from , and priced between . There are Banquet Halls in Undri. Undri features Small Banquet Halls and Large Banquet Halls that are ideal Venues for Private Parties, and AC Banquet Halls and Hotel Banquets that are perfect Venues for Weddings. Top Banquet Halls in are . Banquet Halls in Undri have a capacity range of , and a varied price range from , depending upon the location and type of Venue. Undri harbours some of the Best Luxury Banquet Halls too, such as . Undri features Popular 5 Star Hotels like . These Venues offer Lawns + Banquet Halls, ranging in capacity from , and priced between . WOW Venue’s Recommended 5 Star Hotels in Undri like allow Indoor & Outdoor Catering, Cocktails & Hard Liquor, and Outdoor Music too. These are excellent for any kind of event - be it Weddings, Conferences, Receptions, or Birthday Parties. Resto-bars and Lounges are perfect Venues for Outdoor Parties and Cocktail Parties. Undri houses some of the Top Lounges and Rooftop Venues like , ranging in capacity from , costing between INR . From Budget-friendly #WowVenues in Undri to Premium Luxury #WowVenues in Undri, avail up to 30% off on the venue of your choice at WOW Venue! BOOK NOW! 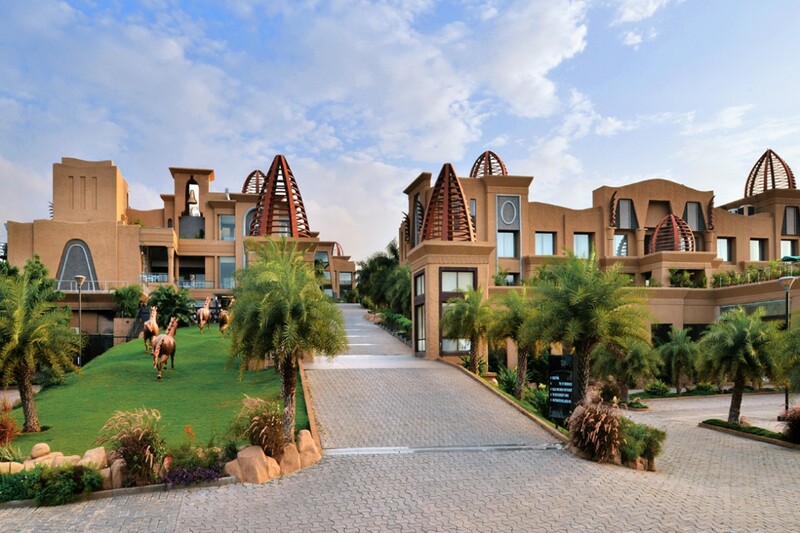 A perfect blend of Moroccan and Egyptian-style architecture, spread across 25 acres of lush green environs in the southern part of Pune, The Corinthians Resort and Club Pune Undri is the epitome of luxury and elegance. Established in 2009, this destination wedding venue in Undri Pune is located in Mohammadwadi perched up a hillock. Among the luxury wedding venues in Undri Pune, the Corinthians Resort offers banquet halls in Undri Pune as an impressive 8000 sq. ft., pillar-less ‘The Grand Ballroom’, which can accommodate 800 guests to outdoor spaces with 50,000 sq. ft. with a capacity of 3000 guests at a time. As one of the 5 Star wedding venues in Undri Pune, The Corinthians Resort & Club offers wedding halls or wedding venues in Undri Pune for any taste and capacity: for 80, 150, 250, 500 people. A versatile event venues in Undri Pune for a multitude of occasions and celebrations. This air-conditioned indoor venue also opens into Colloseum, a magnificent open-air venue. Both the venues can be used as an adjoining space for a grand event. Book their banquet hall in Undri Pune with well-manicured gardens and finely decorated landscapes to provide with an unforgettable experience. Along with elegant spaces, The Corinthians Resort & Club also offers exquisite and well-planned services for corporate events in Undri Pune to make it a successful event. It is a pleasing combination of luxury and elegant.